The new VF620R supercharger system for the E92 2007>2014 M3 V8 features an oversize front water radiator for racers participating in “runway racing”. Often overlooked by designers, cooling systems must be designed with the capacity to sustain full throttle through 4 gears without releasing throttle. It requires tremendous design tolerance not only in the fuel management but also in the charge cooling department. After extensive data logging with independent thermocouples throughout the air system, VF-Engineers found that upgrading the water cooler radiator kept air temps down through successive gears and not just a dyno pull in a single gear. Analytics can be catered to show benefits of an upgrade, but we put this system to test on 16-19 psi supercharger setups to explore its potential. Positive results meant that we introduced this product immediately for the 6-10psi kits and not just our 17psi fully race built engine kits. This upgrade is fully compatible for street use kits and available to purchase as an upgrade to replace your existing “street” radiator originally supplied with your VF-Engineering supercharger kit. The radiator shown in the image above is the item described. the use of the current spec BMW oil lines. The VFE M3 oil cooler is also compatible with all surrounding modifications in which the factory cooler is applicable. Whether you already have a supercharger or you are simply looking to add reliability with vastly improved oil cooling to your factory-spec M3, this oil cooler will help keep your oil temps in check in arduous conditions on the track or sitting in traffic. 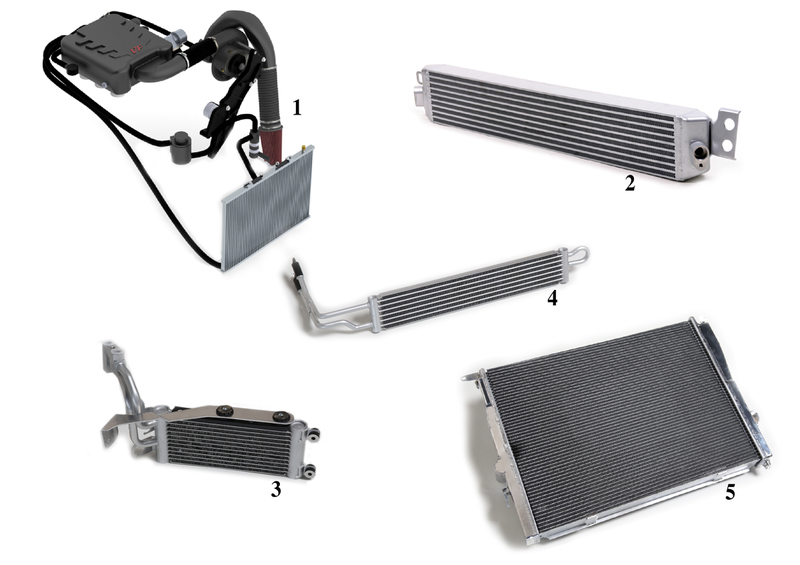 The VFE E9X M3 power transmission cooler for DCT and 6-speed transmissions is the ultimate cooling solution to address high transmission fluid temperatures often seen during track use. Design is a true drop-in fit that requires absolutely zero modification to install. This race-performance engineered component utilizes efficient AC condenser manufacturing technology to deliver a cooler that is 30% more efficient than the OEM unit. The VFE E9X M3 Power Steering Cooler is the ultimate cooling solution for resolving excessive power steering fluid temperatures seen in race and high performance driving environments which often lead to fluid overflow, starvation, and in some cases costly system failure. A true drop-in fit design, the Cooler requires absolutely zero modifications to install. This race-spec engineered component utilizes advanced AC condenser manufacturing technology to deliver a cooler that is 40% more efficient than the OEM unit. The VFE E9X M3 Triple Pass Radiator is the ultimate cooling solution for race and high performance cars, including high cooling demands found in forced induction and high power NA powerplants. All-aluminum radiator features an industry leading core design with B-Tube technology along with an ultra-efficient 6.5mm multi-louvered fin height design. To further the cooling efficiency, the integrated three-pass flow system that guarantees the lowest possible outlet temperatures of any upgraded cooling system available for the platform today. Wind tunnel testing showed heat rejection results approximately 20% more efficient than the OEM unit – enough to keep coolant temperatures fully stabilized during the most demanding driving and high ambient weather conditions.